As the situation resulted in more unemployment, the LIWP lived up to its responsibility to create temporary jobs for the affected groups. More than 30,000 poor people directly benefited from this program as of the end of September 2011. This number exceeded the total targeted number of beneficiaries of LIWP II, amounting by the end of the year to 112% of the target. In the village of Al-Tawf in Qalat Hamid sub-district in Hajjah governorate, the poor villagers are working on the second phase of a project that intends to rehabilitate and protect their agricultural lands, all of which lie in a mountainous area. Mohammed Nasser is a villager who used to make his living selling simple goods in Sana'a until the security threats and declining economy challenged his livelihood. He joined the LIWP project and worked to protect his family’s lands. His mother, Fatima, and his brother, who is partially handicapped, looked enthusiastic and busy while working on two hand-run sewing machines that they had purchased with the wages they earned from the project. Fatima said she works with the family in protecting their lands, providing food and water and taking care of the young kids. "I keep busy all day, working on the project and at home. The project opened other economic opportunities. We purchased two sheep, two second-hand sewing machines and increased and improved the quality of food," Fatima explained. In her leisure time she sews simple plastic bags to sell at the village market. The head of family, Ahmed Nasser, expressed gratitude for the LIWP job. He was working in Saudi Arabia when Fatima phoned him, informing him that he could come home and register to work for the project. 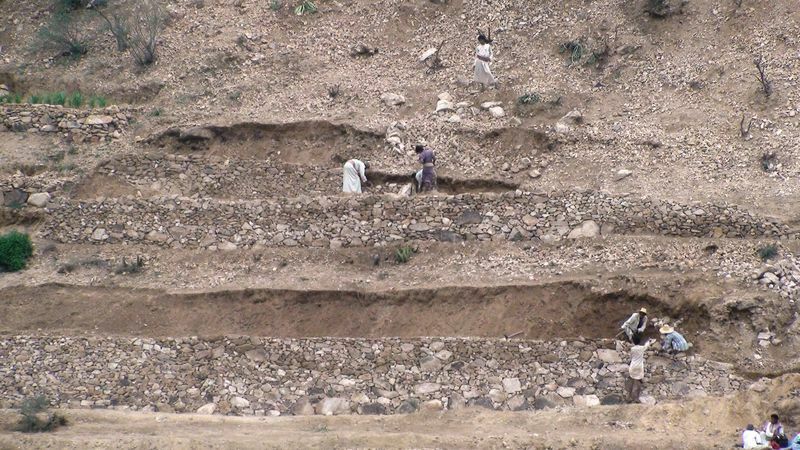 Nasser and other villagers had found it difficult to repair their terraces before the project because it required a large investment of time and resources. The project would also require community stability in order to work, so he promised his family not to work elsewhere. "Having the lands protected, we will have enough living resources from the project, the sewing revenues, and the sheep. And with the expected profits of the crop, we will increase our returns," explained Nasser. He believed that these resources would secure all of his family’s needs, allowing him and his son to stay in the village.